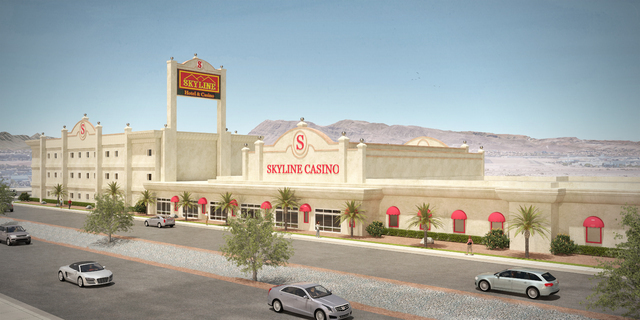 The more than 50-year-old Skyline Casino is getting some additions put on its 4-acre property on Boulder Highway, near Sunset Road in Henderson. 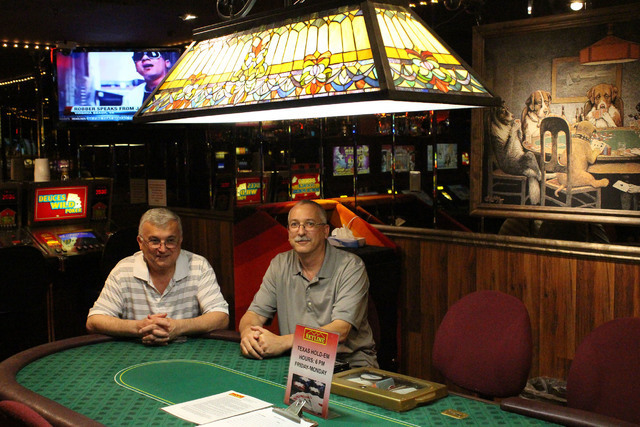 Sam Kiki, general manager at Skyline Casino (left) and Grant Givens, assistant general manager at Skyline Casino (right) at the poker table at Skyline on June 10, 2016. Jeffrey Meehan/Las Vegas Business Press. Casino owner Jim Marsh, the man behind Jim Marsh Kia and various car dealerships and other ventures in Las Vegas and across Nevada since the early 1970s, is adding a 51-room hotel on Skyline’s property, just south of the casino. Marsh said the buildings will connect and allow guests to travel back and forth easily from their rooms to the property’s bar, gaming area and entertainment area where bands perform on the weekends. The hotel addition will feature 18 oversized suites with walk-in showers, king beds, flat-screen TVs and fireplaces, with standard deluxe rooms, which Marsh said are going to be upscale. They’re going to be the nicest rooms in that area, particularly along Boulder Highway, Marsh said. The more than $5 million addition could be finished as early as Thanksgiving, he said. This adds onto some previous renovation work done on Skyline’s casino, restaurant, bar, stage area and sports book some five years back. Those renovations cost Marsh about $2 million, he said. Marsh made a move on purchasing the property in 2003 when then owner John Kish wanted to retire from the business. Kish’s father built the property in 1964 and hired a gaming operator to run it. Kish became part owner in the mid-1970s and took control over the property in 1977. The property’s history dates back even further than that — with a drinking establishment known as the Dixie Bar opening in the late 1940s when the region had little development amid a vast amount of open desert. Today, the Henderson region surrounding Boulder Highway has been seeing a boom in new housing in developments such as the master-planned community Cadence with 13,000 planned single-family homes and commercial space on the drawing board, entertainment projects and the nearby Union Village becoming an epicenter in medical tourism. The Skyline has catered to retirees over the past several years, as the average age of gamblers has risen over time. But that could change in the coming years. Grant Givens, assistant general manager and director of administration at Skyline, said a younger demographic could start to come in with the uptick in development in the region. Regional development could also be a boon, in general, for the property’s upcoming hotel. “I see a lot of reservations generated because of the medical center, with people coming in town and visiting,” Givens said. Skyline could start taking reservations sometime in July. That adds to the current phenomenon of the younger generation coming to the Skyline. “We started having the younger generation too, with the Party Pit, music and poker,” said Sam Kiki, general manager and director of food and beverage at the Skyline. Kiki also hopes to add 20 to 25 more employees to Skyline when the hotel comes online. Maintaining a connection to the site’s history is part of the plan. The hotel’s decor is going to feature an antique chandelier, with stained-glass window from Dirty Sally’s — a discotheque and backgammon club that once sat on the site of what is now Wynn Resorts at Sands Avenue and Las Vegas Boulevard. The Skyline purchase wasn’t Marsh’s first dabble in the gaming industry. 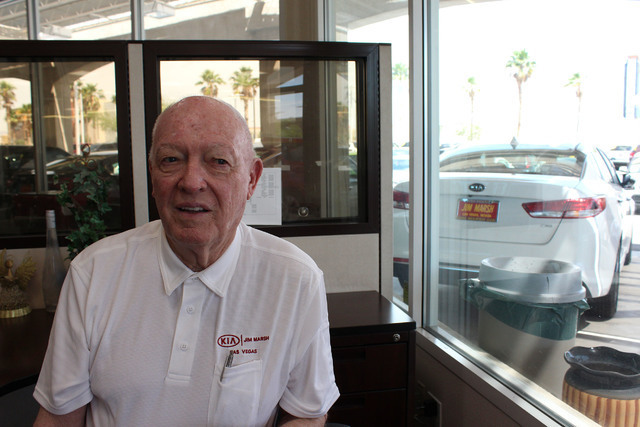 On top of his Kia dealership, and the impending relaunch of his Chrysler Jeep dealership, Marsh said he has bought several gaming establishments and taverns throughout rural Nevada over the years including Tonopah Station, the Longstreet Inn in Amargosa Valley and a bar and motel in the Nevada town of Manhattan.